Vastu Shastra is a science of architecture that guides human to choose a path of happiness by complying with ancient principles embedded in immemorial Indian text of Vedas. A complete guide of Vastu will let you understand the norms and regulations of Vastu directions and placement so as to achieve 3 P’s of life- Peace, Progress and Prosperity. The science of direction acquaints people with the majestic powers of directions that render all-round peace and harmony to the inmates. Vastu-Shastra lays down many principles that are been followed since the ages in order to create this earth favourable inhabitant for people. Our living place has the enormous power to influence our mind, body to bring happiness and prosperity. The concept of Vedic Vastu is entirely based on five elements that make our earth and human body. All the Panchbhootas have their allotted directions which need to be balance with their corresponding elements to attain peace and nullify negativity. Evaluation of land is significant and primary step in seeking Vastu help because a plot’s typography including soil test, surroundings and fertility etc informs about what land can give to the people about to live there! A veteran Vastu expert can easily feel the vibration and negative energy just by reaching there while to make sure he/she performs some tests pertaining to testing colour of soil, fertility of soil and surroundings of plot. If all the tests are cleared without discrepancy and error that expert commands to buy such plot. Land evaluation must be taken prior purchasing the site as it involves huge investments and if process goes against the land, one must not buy such property. It is important to assess directions of land purchased or about to purchase in order to find out the relevant crux for inmates. Shape of land is another significant aspect that needs to be considered while examining land. Generally regular shapes are preferable such as rectangle or square and irregular shapes including sher mukhi are not considered good for residential purpose. Conditions for gau mukhi and sher mukhi plots varies from residential and industrial purpose, thus there is need to consult an expert. 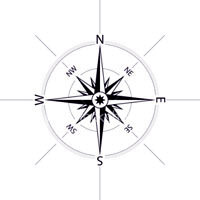 Lands in rectangular or square shape but facing squarely on four cardinal directions are ideal to be purchased while any tilt is acceptable in such plot. A plot that has been sandwiched between the two plots is not good to purchase as it tends to bring poverty. Slope of land should be towards North or East but never be in West or South. Avoid plots having obstruction on sides like East, North and North-east. Avoid a residential plot near temple, school, hospital or factory. Construction of building should be stopped in the middle, if it has started make sure it doesn’t stop for nay reason. Construction material and other raw material should be placed in South-west corner or in this area any storage room can be made to keep raw material. Watch man or guard must be given place in South-east and avoid North-west or South-east for placing servant or watch-man. There must be an order of construction such as: Well or boring, store house and then boundary wall. Roads running around a square plot from all sides are believe to be very good and must be purchased even if at highest prices. Owner of such property prospers in every way around such as good health, wealth and happiness. There are proper guidelines regarding roads which inform that which road alongside the plot have good effect or bad effect. For instance, road running along the plot ends at North-east is considered good and auspicious. T-point, L-shape and Y-intersecting point must be avoided when purchasing a plot. Material for building house or factory must be new and no old material should be used for new construction. Old material should be thrown away because old material including wood, soil or bricks gives off negative energy. Apparently as discussed above only rectangular and square shapes are considered best for construction. Avoid t-point, Y-intersection, oval, circular, or any other irregular shape plot when buying a new plot as it brings bad luck and regard as inauspicious. Gau-mukhi (cow faced) plot which is generally narrow in the front and wider in the later half is ideal for residential purpose. Sher mukhi (tiger faced) which is wider in the front but goes narrow in later half is not good for residential but suitable for industrial purpose. Water resource is considered ideal in North-east but one must consult a Vastu consultant to make appropriate way for under-water and over-head tank. Incorrectly made tanks can cast undesirable effects on inmates in terms of loss of health, wealth and stress and anxiety. 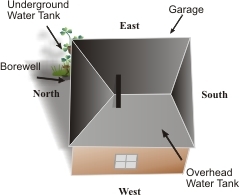 Under-water tank is best to be constructed in North-east which is ideal position and brings enormous wealth to owner. Over-head tank must be constructed in South-west which is a place for heavy materials but avoid under-ground tank or boring in this portion. Construction of Compound wall should be done before building other construction. This must be done with due offerings and on the auspicious astronomical dates. South-west is ideal to start with construction while compound wall should not be higher than main wall of house. Garage in living place has become a necessity for every home but some essential things need to be remembered before constructing this important area. Garage should be build having entrance in East or North. Avoid parking vehicles facing South and even corner likes South-west or North-east must also be avoided for parking. Parking in the basement is good option but always choose East or North of basement for constructing garage. This area should be well lit and de-clutter to maintain the flow of energies. This important section of house should be built in North-east or East so that it receives maximum sunlight during the day time which is essential for positive energies. Balcony or open patio roof must not be higher than main building and if there is any tilt in this area North-east is ideal. Avoid arch shape corners in open patio/balcony. No creepers should be incorporated in balcony as creepers are good at outside or exteriors of house. All the rooms in a house must be situated at proper location such as living in East, master bedroom in South-west, study room in North while study table should face such that person sitting on it face East or North, children room in West and kitchen in South-east. Stairs should be constructed in South, West or South-west and must be in odd numbers running clock wise. Windows in West should be small while large windows can be made in Eastern side. Mirror elements and decorative pieces must be hanged on North or Eastern wall facing South or West. Doors in house should not be in one straight line leading people from one room to another. Finance corner should be preferable in South-west opening towards North. Entrance gate has got huge significance in Vastu-Shastra and this gate must be bigger and stronger than other gates of the building. Entrance gate should always have two shutters and there should not be any direct wall in front of entrance gate. Avoid any barrier or obstruction in front of entrance. This place should be tidy and clean and kind of clutter can obstruct positive energy to flow in. East entrance is always preferred with lots of open space in North-east but if entrance is in South then do not leave open space. Entrance door should be decorated with auspicious symbols and signs but avoid evil symbols and mourning or horror pictures. Ideal position for pooja or worship room is North-east or East but other directions should be avoided as they are inauspicious. If there is no provision for worship room here in the North-east then do not make toilet or dump any clutter over this area. North-east must be kept clean even if this portion is not used worship due to space constraint. Idols should be placed in such a way that when we sit God’s feet should come to our chest level. Idols of God should be not more than 10 feet and less than 3 feet. Avoid toilets near pooja room. Master bedroom should be located in South-west of the room where retired owner should rest while unmarried should never be given this room as it obstructs their marriage prospects. Girls should be given North-west room and boys can be given with South room. Any kind of metal bed should not incorporated in bedroom. Mirror should never come in front of bed displaying image while mirror can be placed along side the bed. Avoid sleeping or sitting under the beam. Ideal position for locker room is South-west which opens towards the North. Though North is the place for God of wealth- Kubera, yet it is advisable to locate locker room in South-west only as it provides safety from theft and increases wealth. Put a mirror in the locker where all money is being kept so that money reflects in mirror. Ideally bathroom and toilet should be placed in West or North-west but avoid straight East and North-east. In toilets WC should not face East or North while South is best position. WC should never come below the stairs as it leads to health problems. Washbasin can be placed in North-east, North and East. Drainage of bathroom should be given in North-east or Northern side. Septic tank can be located in West or North-west but never in East or North-east. Basement should be constructed in East or Northern side and must not be for constructive purpose such as residence or recreation. Basement is best for parking and storage and any kind of residence should be avoided. More space should be left in North and North-eastern part of basement. Do not dump junk stuff in basement and make sure this place is tidy and clean. About ¼ area of basement should be above the ground. Basement should be painted with light & subtle colours.